Wednesday, August 28th, 2013 . 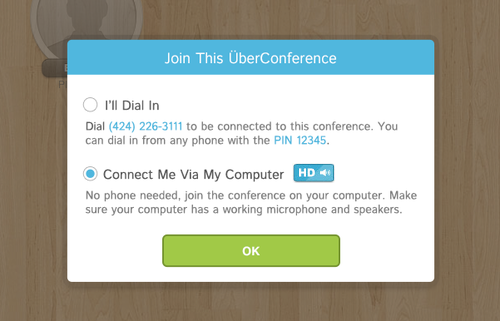 We’ve just upgraded UberConference to High Definition (HD) audio. Anyone who joins a conference call from their computer now sounds absolutely fantastic. As if our visual interface wasn’t enough, now you’ll really want to connect to calls through your computer. Call into your next conference call on Chrome to experience the difference. Schedule your call now! For now, Google Chrome is required to enjoy Audio HD. We’re working on adding support for Firefox. As more browsers support WebRTC, we’ll add them too. Tuesday, August 27th, 2013 . Las Vegas in the summertime is even hotter if you work in the IP communications industry. IT Expo is the conference to attend because it’s where IT decision-makers go to figure out which technologies are the up-and-comers, and how to best spend their budgets. Carriers, service providers, government agencies, enterprise companies, manufacturers and developers all come together at this big event. On Wednesday and Thursday, UberConference CEO Craig Walker is speaking on two papnel talks, 5 Technologies Critical to the Future of Business and Service Providers: Smart Ecosystem Facilitators or Dumb Pipes? Make sure to check them out if you are at the conference. From keynotes that include Apple founder Steve Wozniak, to killer sessions like “Battle In The Clouds,” as well as the WebRTC SchoolTraining and Certification program, IT Expo contains some of the year’s best communications technology content. 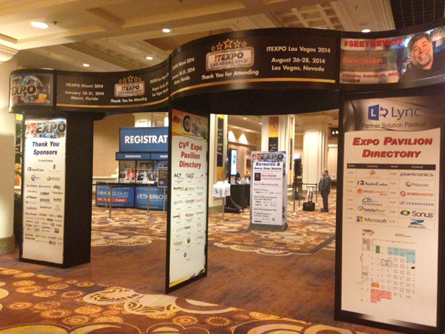 To follow some smart telecommunications conversations, check out IT Expo on Twitter. Thursday, August 8th, 2013 . This week, UberConference, Zendesk and Esna announced that they’re joining the Cloud Alliance. Other notable members include Insightly (CRM for Google Apps), Smartsheet (Apps-integrated project management), Yesware (Gmail productivity for sales) and LucidChart. The resellers in the UberConference Google Apps reseller program can connect you with the Cloud Alliance partners. Google Apps has 5 million businesses as customers, including 66% of the Top 50 startups, and 72 of the Top 100 Universities. The Google Apps software marketplace has exploded recently. Although there are hundreds of apps in the Google Apps store, a select group of trusted independent software vendors formed the Cloud Alliance, to serve the unique needs of I.T. administrators and Google Apps end-users. In addition to key whitepapers on Google Apps administration and product demos, the Cloud Alliance website contains webinar replays and the First Annual Benchmark Report For Google Apps. It’s a must-have for any company that’s gone Google, or is even considering it. Want to receive updates from the Cloud Alliance to learn how you can better meet the needs of your Google Apps users? Click here.